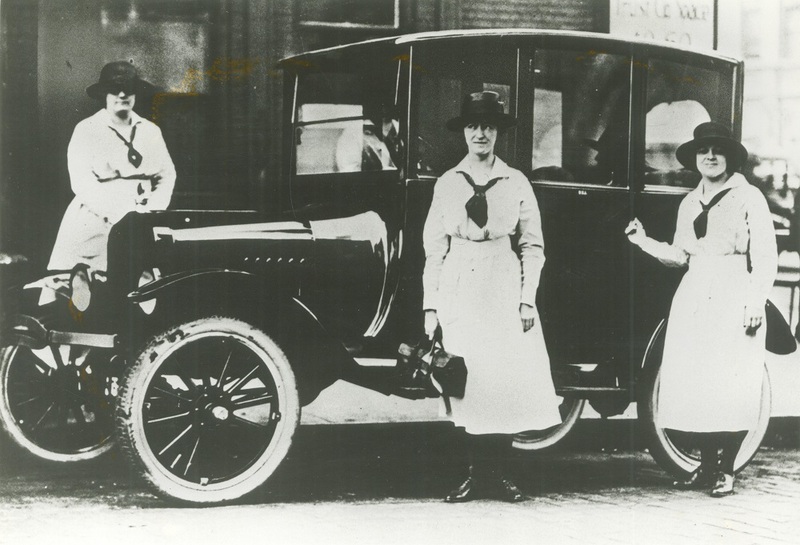 The Visiting Nurse Association of Milwaukee originated in 1906 when Milwaukee businesswoman Sarah Boyd hired Maude Tompkins, a nurse with the Visiting Nurse Association of Chicago, to live in her home and provide free health care to nearby low-income residents. In 1907 Boyd, Mariette Tweedy, and other civic leaders incorporated the Visiting Nurse Association of Milwaukee (VNA). This non-profit organization aimed to provide “nursing care and health instruction to the sick in their homes, regardless of race, creed, color, or ability to pay.” Boyd served as the VNA’s president until her death in 1924. The VNA grew rapidly. Within five years it grew from two nurses to fourteen full-time nurses and nearly fifty volunteers organized into several auxiliary guilds. In addition to providing free and reduced cost health care to Milwaukee’s poor, the VNA also spearheaded several innovative public health initiatives later taken over by city agencies. Beginning in 1908, for example, the VNA began nursing tuberculosis patients, a function assumed by the Milwaukee Health Department’s new Tuberculosis Division in 1912. Similarly, the VNA staffed infant welfare clinics from 1908 until 1911, when the city’s Child Welfare Commission took over the program. In 1914 the VNA began a social services program for patients at Milwaukee’s Children’s Hospital, work that was later assumed by hospital staff. The VNA grew in patient numbers and service region throughout the twentieth century. By 1928 VNA nurses were visiting patients in homes throughout Milwaukee County; by 1958 the organization extended its services throughout the Greater Milwaukee area. The VNA’s industrial and contract services provided health care for employees and policy holders of participating businesses. These services grew in popularity during the first half of the century, peaking during World War II. The VNA also offered health education and social services, including classes for expectant mothers and access to fresh breast milk through a Mother’s Milk Station. The expansion of publicly-sponsored public health services in the latter half of the twentieth century changed the work of the VNA without diminishing the organization’s size or the importance of its contributions. The creation of the federal Medicaid and Medicare programs in the mid-1960s, for example, greatly increased the number of people receiving state-funded health care. The VNA continued to provide free services to patients whose incomes were higher than the Medicaid maximum and who were too young to qualify for Medicare, as well as providing health care services directly to Medicare and Medicaid patients. By the early 1980s these two federal programs were the VNA’s largest source of revenue. In 1988 Aurora Health Care, a Milwaukee-based non-profit health care system that serves eastern Wisconsin and northern Illinois, absorbed the VNA. Renamed Aurora Visiting Nurse Association of Wisconsin, it continues to offer home health care services to patients throughout Wisconsin. Among the services it provides in the 21st century are annual flu immunization clinics, home health aides, educational and rehabilitation therapy programs, as well as hospice and end-of-life care for elderly and terminally ill patients. ^ Visiting Nurse Association of Milwaukee, Annual Reports for 1927, 1947, and 1981, all in Milwaukee Public Library, Milwaukee; “History of the Aurora VNA of Wisconsin,” Aurora Health Care website, http://www.aurorahealthcare.org/services/vna/history/history.asp, accessed November 8, 2013. ^ Visiting Nurse Association of Milwaukee, 1912 Annual Report. ^ Visiting Nurse Association of Milwaukee, 1947 Annual Report. ^ Visiting Nurse Association of Milwaukee, 1947 Annual Report; “Milwaukee Will Have Breast Milk Station,” Milwaukee Sentinel, August 28, 1938, http://news.google.com/newspapers?nid=1368&dat=19380828&id=RoxAAAAAIBAJ&sjid=Kg0EAAAAIBAJ&pg=4887,3933622. ^ Visiting Nurse Association of Milwaukee, Annual Reports for 1967, 1968, and 1981, Milwaukee Public Library, Milwaukee. ^ Visiting Nurse Association of Milwaukee, 1981 Annual Report, Milwaukee Public Library, Milwaukee. ^ “History of the Aurora VNA of Wisconsin”; “About Aurora Health Care,” Aurora Health Care, accessed November 11, 2013; John Fauber, “Nurses Identify Those to Get Flu Vaccine,” Milwaukee Journal Sentinel, November 2, 2000; Joe Manning, “Hospital Mix-Up Ruins Flu Vaccine,” Milwaukee Journal Sentinel, October 21, 2004; “Hospice & End of Life Care,” Aurora Health Care website, accessed November 11, 2013; “Home Health Services,” Aurora Health Care, accessed November 11, 2013. Leavitt, Judith Walzer. The Healthiest City: Milwaukee and the Politics of Health Reform. Princeton, NJ: Princeton University Press, 1982.